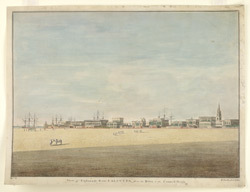 Handcoloured etching with aquatint of Esplanade Row from the river to the Council House in Calcutta by William Baillie (1752/3-1799) from plate 1 of his 'Twelve views of Calcutta' published in 1794. Esplanade Row runs east-west to the north of the Maidan, an open space in which the new Fort William was built in 1757. By the end of the eighteenth century, Esplanade Row was the location of numerous public buildings including the New Court House, the Supreme Court, the Council House, the Mint and the old Government House. Four years after this view was etched, Marquis Wellesley built the new Government House here.